Perhaps you are new to the game and just learning the rules of pickleball, or maybe you’re an old dog trying to learn new pickleball tips and tricks. When it comes to pickleball, it’s never too late to work on your strategy and improve your playing performance. Pickleball combines elements of tennis, badminton, and table tennis. But the equipment of pickleball is very different than all three. Its court set-up is slightly different than a tennis court, with much closer similarity in layout and dimensions to a badminton court. For a good general strategy, you want to offer up a good serve, a good return, and a good third shot. Depending on whether you are playing a game of singles or doubles, the rest of the strategy may differ. Playing a singles game of pickleball is much simpler because all the responsibility for your own team (you) comes from one person (you). There’s no trying to figure out who will be better positioned to return the ball or making up for your partner’s weaknesses. There is, however, higher pressure on performing well every hit. Learning to hit properly for the game will be your most reliable skill in a singles pickleball game. Hit your serves firm and deep into the court to start the game off right. Your other hits should vary in direction to keep your opponent on his or her feet and keep the energy at a high level. And using a good pickleball paddle for spin can allow you to add movement to the ball, making it harder to return. When you serve the pickleball, do so from close to the center line so you can be in a better position to return. Rather than serving from the back for “a good hit,” and then running forward towards the net to return the ball quickly, station yourself closer to the center so you can access the front area much quicker. Aim your returns deep and toward the corners, which again will keep your opponent moving on his or her feet (Notice a theme here?). You’ll also notice that when we explore strategies for doubles games, this strategy completely switches. In a singles game, your opponent will be positioned in the center of the court since they have it to themselves. You want them to have to run around to return to you, so aim for the corners. For doubles though, there’s negative space in the center of the court split by the two players, so you’ll be aiming for that sweet spot. But we’ll get to that later. Try to stay near the center area of the court. This is more than likely the area shots will be coming towards, so you want to be accessible to all the action easily. The back ⅓ of the court is a good general guideline. Once you have the basic skills of the hit, the serve, the return, and the position down pat, the real skills and strategies needed to win begin. This is a competitive game, so you must be thinking both defensively and offensively at the same time. That means anticipating your next move and your opponent’s, staying light on your feet, observing for weaknesses to exploit, and keeping sharp to the rules. One aspect of winning strategy can come through the variance of your shots. Someone that has one or two go-to shots can be easy to beat as soon as the opponent is familiar with them. Someone skilled in varied shots, however, is a wild card that is much harder to read, anticipate, and thus respond to. Vary your shots in angle, distance, strength, and backhand/front hand. An opponent who has been expending more energy to keep up with you will have less energy to win themselves, so switch up your hits often. Another aspect of winning is the ability to recognize weakness in the opponent and be able to identify and execute methods of exploiting it. Watching during warm-up can offer a peek into their skills. If you don’t have that opportunity, pay attention to the way they hold their paddle. It can indicate their natural throw or warn you of a backhand. Once you identify the weakness, a great player will find a way to take advantage of that in their own favor. For example, if you know your opponent has a weak backhand, send out shots that will force them to use it. Be sure that you are stationing yourself in the center as far as forward and backwards goes (mentioned above). While staying central, remain mobile on a left-to-right plane as your opponent shifts in order to anticipate or respond to their moves. This is a pretty safe zone to remain in because, if needed, you can run backwards to return a far shot or you can get up to the net quickly. For agile mobility and the ability to move quickly, remember to stay on the balls of your feet. Don’t let yourself go flat-footed, else you won’t be able to adjust quickly to a shot that’s going to the sides or corners. Wandering forwards or backwards and staying there could put you in a weak spot against your opponent, so remember to maintain a base in the center. Pickleball with a partner on your team can add to the fun and dynamic. It also adds many more dimensions to the game that really elevate it from a simple one to a complex and competitive match. Now, advanced pickleball strategy levels must be reached. 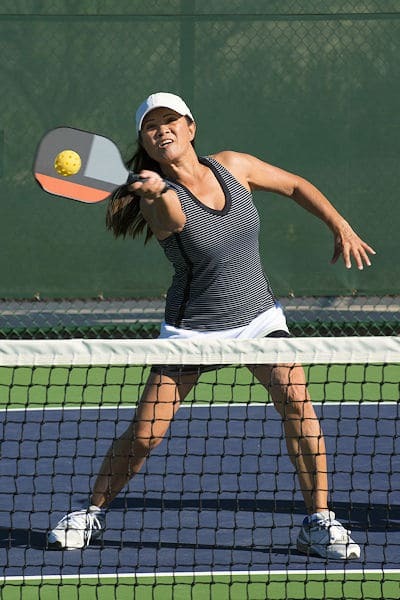 The strategy adjusts almost entirely with the addition of a new player, so let’s cover pickleball doubles strategies so you can perform at your highest with your partner. Whether your team is serving or returning, you can’t have a good pickleball game without proper and accurate hitting. Even a veteran player knows that the best pickleball hitting techniques (better than any fancy trick shot) involve a simple shot that that gets its way to the court. Getting to the point and getting the ball deep into the court is the best way to start a game off. Of course, consider your opposing team and where their weaknesses lie when executing the serve. If they have a weak back shot, you might send it a bit harder to take advantage of that. Most importantly, though, keep it simple. Once the ball is in motion, the returning hitting strategy comes into play. Try to return the ball towards the center of the court so the opposing team members will both move to the middle to try to hit the ball. It will keep them on their toes. The third shot is when the game *really* begins. There are some popular types of shots that players often use as their pickleball third shot strategy. The most reliable may arguably be the Middle Drop Shot, which involves a low hit over the pickleball net right into the middle of the court. A Hard Hit is a common go-to for new players. They are aiming for hard, high, and out-of-the-way. This would be a good strategy if the points were won in the back of the court (or baseline), but indeed the points in pickleball are earned at the net. An intermediate pickleball third shot strategy you choose to use may include a Dink, a Lob, Down the Line, Side Drop Shot, or Drilling the Net Person. Once you feel comfortable with the game, learn these techniques to up your skills. After the first three introductory hits, just aim to keep the ball moving and the game going. Most points in this game are won in error, so the less downtime to make such errors, the better. Remember, aim for a deep middle shot to keep the game’s energy up. During warm-ups, remain observant of your opponents and look for where their weaknesses may lie. The way they hold and launch their paddle may indicate their style of hits and may also help you prepare in defense of them. It can be easy to fall into a pattern of hitting the ball back and forth between each other, but that sure makes for an anticlimactic game. Remember to aim DOWN with the ball. The game can be a fun and high-energy one when everyone is on their toes both physically and mentally. Sharp players will be quicker on their feet and responsive to all kinds of hits, ready to run around the court if they must. In those cases, having a great pair of pickleball sneakers can really help your game. Top players can also think critically, anticipating their opponent’s next move and acting proactively to counter them. Whether you are playing a game of singles or doubles, you want to approach the game with a unique strategy that fits you or your team and best equips you against your competition. Begin by assessing your personal skills such as serving, returning, and hitting the third shot. Get those to a top-notch level. Then, work either with yourself or your partner on your strategy in the heat of the game. Let your competitive nature guide you. Use your strengths to exploit your opponent’s weaknesses and keep the ball moving until you’re the winner.